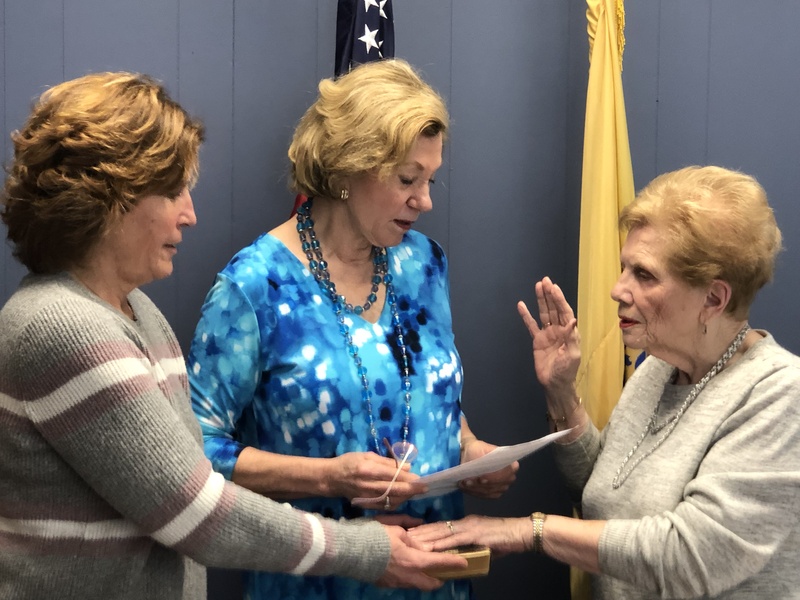 Union County Board of Elections Commissioner Marie Oakie is sworn into her fifth term. Administering the Oath is Union County Clerk, Joanne Rajoppi. Holding the Bible for Commissioner Oakie is the Election Board Administrator Nicole DiRado. 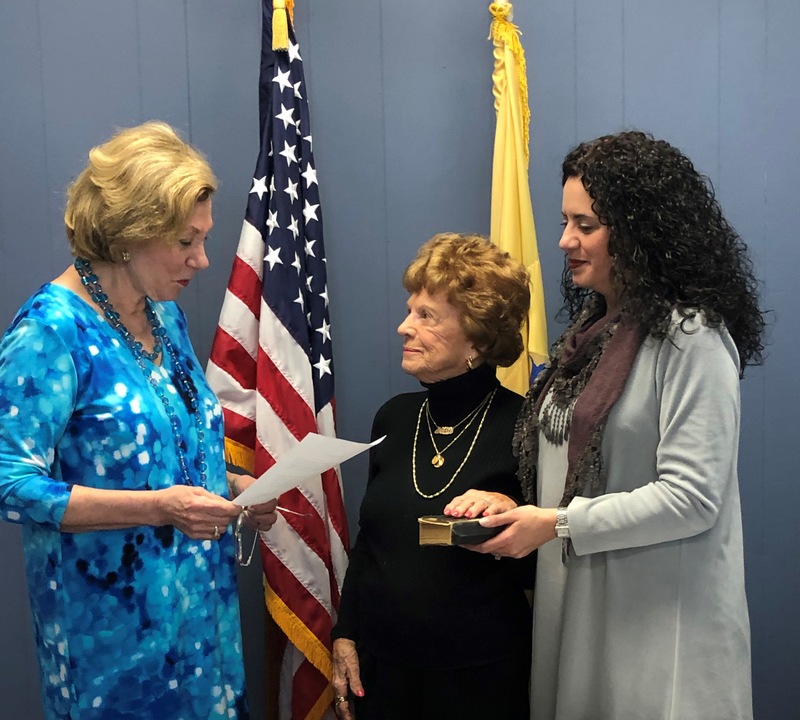 Union County Board of Election Commissioner Mary Ellen Harris is sworn into her eleventh term. Administering the Oath of Office is Union County Clerk Joanne Rajoppi. Holding the Bible for Commissioner Harris is her daughter, Joan Polidore. It was a rough debut for some new, more secure, voting machines in New Jersey, which were tried out for the first time in Westfield, Tuesday. The ExpressVote XL machines, which Kane In Your Corner first told you about last week as part of an investigation into election security, caused delays, both at polls and in reporting election results. As Kane In Your Corner reported last week, the piloting of the new machines in Westfield marks the first step in New Jersey’s efforts to replace its outdated, insecure vulnerable voting machines. Experts say the machines, some of the oldest still being used in the US, can be hacked, and they produce no paper backup in the event something goes wrong. But election officials say those paper backups were the cause of some of the issues in Westfield. Voters insert blank cards into the machines before making their selections. The machine then prints out a paper ballot for voters to verify. DiRado says some poll workers gave the cards to voters too soon, and some of them folded or bent the cards while standing on line. That, in turn, caused machines to jam or fill up too soon, she says. DiRado says in the future, poll workers will be instructed not to provide the cards until voters are entering the voting booth. WESTFIELD — A s part of a pilot program for this year’s midterm elections, the town is using new electronic voting machines. On Friday, Union County Board of Elections Administrator Nicole Dirado gave FiOS1 News an inside look at how they work, from the touch screen to a paper verification system that makes sure that votes are being counted properly. “Assurance that the votes that they casted are being properly recorded by the machine,” Dirado said. When voters in Westfield go to their polling place on Election Day, Dirado said they will sign the poll book and receive both their voting authority slip and paper ballot card. That paper card will be placed into the new machine. Once the card is placed inside the machine, it is now activated. Dirado said the machine’s display is designed to mimic what voters are used to on election day, except this time, voters will select who they are voting for by using a touch screen, and put forth write-in-candidates by pressing the touch screen and typing in the candidate’s name. There are accommodations if voters need to see bigger text or have trouble seeing certain colors. “You could make the text larger that people who are colorblind or have difficulty differentiating color, it can go to the black and white contrast,” Dirado explained. Once a person makes their selections, they press the touch screen to print them out. Dirado said this is where the voter can review their choices and make sure everything is correct. Once this is done, the voter presses the touch screen where it directs the user to cast the vote. “They cannot be hacked. These machines do not touch the internet,” Dirado said. Officials said the new voting machines in Westfield were rigorously tested by the residents with disabilities before being unveiled.